Good Morning sweet friends! I hope you are making preparations for a family filled weekend that makes your holiday special. I’m prepping kits for some upcoming event so the week has been full of binge watching some tv shows while I’m cutting. Well, that’s more binge listening but I love a good series when I have time to see it at once – I’m not good at waiting week to week. So, I’m popping in today for a short Day of Giving Friday post – very short :-) I shared this card previously on the Spellbinders Blog but someone asked if it would make it into the giveaway pile. And I said, yep!! 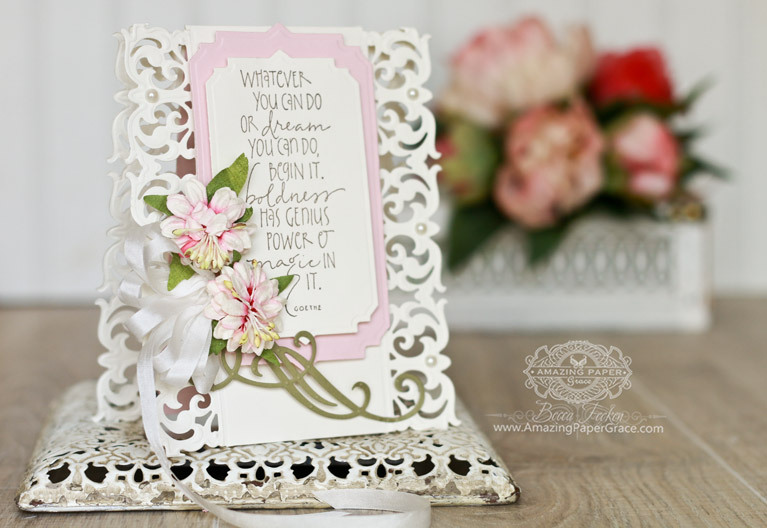 This card is built on a base that is 5-1/2″x 7-1/2″. I used Spellbinders S4-707 Graceful Damask Border to cut along the sides. The side mounted borders give your card a very tall look and is really a kind of unique presentation when you do it to the back also. I mounted the sentiment on a panel cut using Spellbinders S5-250 Art Deco Astoria Labels. Lastly, to give a touch of elegance to the flowers, I added the flourish from Spellbinders S6-082 Classic Elegance Label. I can’t wait to try this format with some of the other borders! For new readers, every Friday it’s my pleasure to give away a card. The card goes to a randomly picked reader (worldwide) who leaves a comment in our conversation. Want to know more about Day of Giving, here’s a link to my FAQ’s just check out #11. You can check the list of winners HERE! For your comment: What are you most grateful for today? Bless you all!! Enjoy your weekend!! 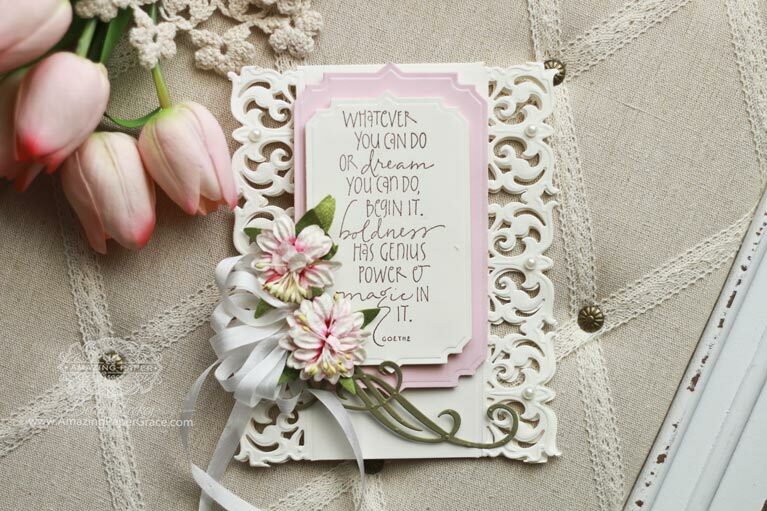 Beautiful card Becca – great encouraging sentiment too! Today I most thankful that one of my best friends knew the Lord and so slipped away to Heaven yesterday. Even tho’ my heart hurts for her, I am rejoicing that she is in Heaven and knew she was going there! The card is gorgeous and so elegant! This is absolutely stunning!! Love that sentiment! Love the sentiment on this card – and as always the card is so perfectly elegant! Today – I’m grateful for the silliness of a pregnant giraffe – who for the past few weeks has kept my mind light and calm in the midst of a politically troubled world. The grace of God in a giraffe for me. Blessings, and happy Easter, Becca! What a beautiful card Becca! I love the way you layered the Astoria labels in soft pastel pink and white. As always, your bow is awesome. As we celebrate Easter, I’m grateful for Jesus Christ who died for our sins, that He rose again, and that I know where I’ll be spending eternity. Love the way you used the border die on this card… very stunning! A very beautiful card becca , i am grateful that my poorly son has a devoted loving wife to care for him. Your card is beautiful, today I am grateful for my family and I to be healthy, happy and safe. Love this card and have been trying to do this too Beca. what am I most grateful for? Good health… watching my brother with lung and live cancer and my SIL with pancreatic cancer I am so grateful that I am healthy. and intend to stay that way. Another beauty Becca – I am most grateful today not only that it is Easter and all that that means, but I am also very grateful for the hospice and the wonderful supportive staff where we currently are, and the way they care for both DH and myself. What a gorgeous card as always! Today I am grateful for Jesus in our lives & for the love of my family. We are not perfect, but we are always there for each other. What a lovely card. All of your cards are so fancy and beautiful! thanks for sharing. Have a blessed Easter! I love this dainty card so much. The sentiment is very encouraging on the very day I needed it the most! Thank You so much (((hugz))). Hi Becca thank you for sharing this card it’s lovely ! it’s this what makes us better humans . I am grateful that the Lord loved us enough to send His Son to die on the cross. Good morning Becca, Happy Easter!!! gorgeous gorgeous card!!! I’m grateful for my loving family!!! Gorgeous card! I am grateful for the unconditional love my parents gave me and in turn I instilled unconditional love to my family. Gorgeous card! I love the dies you used and the pretty embellishments! This is just such a lovely, lacy card. I love those Damask Borders!! So, so pretty! I am grateful that I serve a risen, living Savior. Love this very dainty card, Becca. I am grateful for our Lord and Savior, He has Risen, Alleluia, Happy Easter! Hugs to you Becca for all your kindness! Once again you´ve made such a beauty here Becca. I love the beauty and the elegance, that always show in your cards. I´m sooo grateful for my loving family (kids and grandkids) and what they´ve become as adults, and such loving and caring people, they´ve turned into. What more can a mum ask for? Morning Becca, Oh fabulous !! When I get my damask border dies delivered I will be trying this technique, you always give us lots of ways to use your die sets, fabulous !! I am grateful for ‘wakening up’ today, and also grateful but saddened that Our Lord had to go through all that pain and suffering, for us !! Easter is a very poignant and thought-provoking time in our Religious Calendar. Enjoy your Easter Day Eve. I am so thankful for the sacrifice Jesus made for my salvation that we honor this weekend. It is His resurrection that makes the darkness of His sacrifice shine with God”s holy light. I am also thankful for my family and especially my Mom, who has been in the hospital for 11 days with a very serious case of pneumonia. I know she is in God”s hands and at 85, I am grateful she is a woman of faith and has been an example to all who know her of a Godly woman. Another beautiful creation Becca. You never cease to inspire me! This is one of the most beautiful cards I have ever seen! I so hope I win this one! I am grateful for Gods love and blessings, the two beautiful daughters he blessed me with along with wonderful friends.